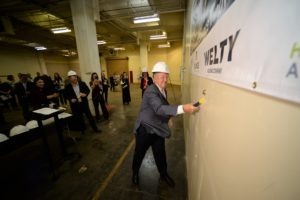 Cleveland.com – May 14, 2018 – AKRON, Ohio – Mayor Dan Horrigan, Bounce CEO Doug Weintraub and Bounce Board Chair Deb Hoover donned hard hats on Monday to take a sledgehammer to a wall at Akron’s center of innovation, kicking off construction. The Welty Building Co. will manage construction of 27,000 square-feet of Bounce’s first floor, adding a new entryway, office space, a co-working area, a maker space, a cafe and meeting areas, conference rooms and an e-sports lab for the University of Akron. Hasenstab Architects of Akron will design the space. It makes sense that Bounce is situated in the former B.F. Goodrich Building on Main Street, where millions of tires were made over the years, Horrigan said. As a young entrepreneur, B.F. Goodrich came to Akron from New York to start the tire company, helping put Akron on the map as the Rubber Capital of the World. Bounce, which evolved from the former Akron Global Business Accelerator, serves entrepreneurs and small startup companies. The space is being expanded to offer maker- and co-working space, while training, mentoring and classes will be open to the community. Bounce is designed to attract not only entrepreneurs and inventors, but also businesses, investors, schools, corporate executives, students and residents interested in using innovation to create jobs of the future. “The City of Akron is ready to assist, mentor and support its innovators, makers, founders and inventors,” Horrigan said. Weintraub was brought on board in March to serve as CEO of the innovation hub. He was a founding member and chairman of Cleveland’s nonprofit Jumpstart Inc., which works to build and support startups. 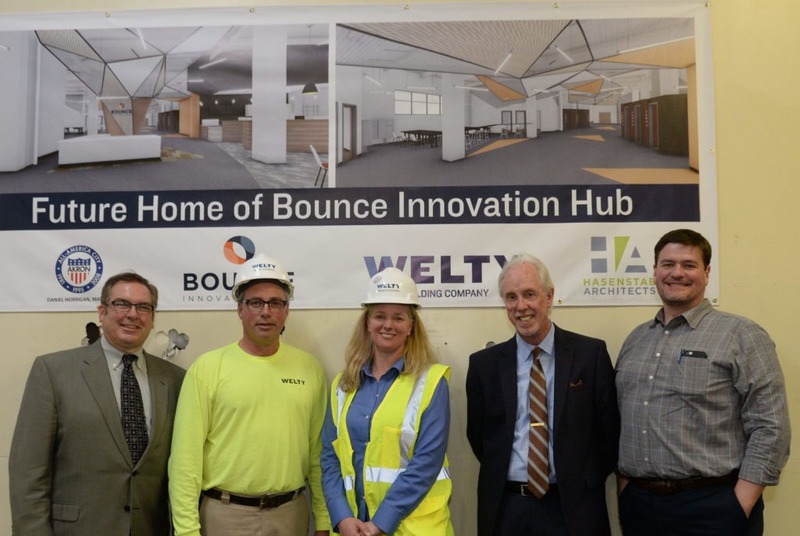 Weintraub announced the addition of a new company joining Bounce this summer, whose founders launched a startup at the Global Business Accelerator in 2004. Knotice, launched by Akronites Brian Deagan and Bill Landers, was a data management and digital marketing company that was sold to IgnitionOne in 2014. Now, the pair is launching a new startup, CompanionLabs, from a space on the 9th floor of Bounce. “We want to see the area do well and with the energy that’s being injected into this space, we just want to be a part of it,” Deagan said. 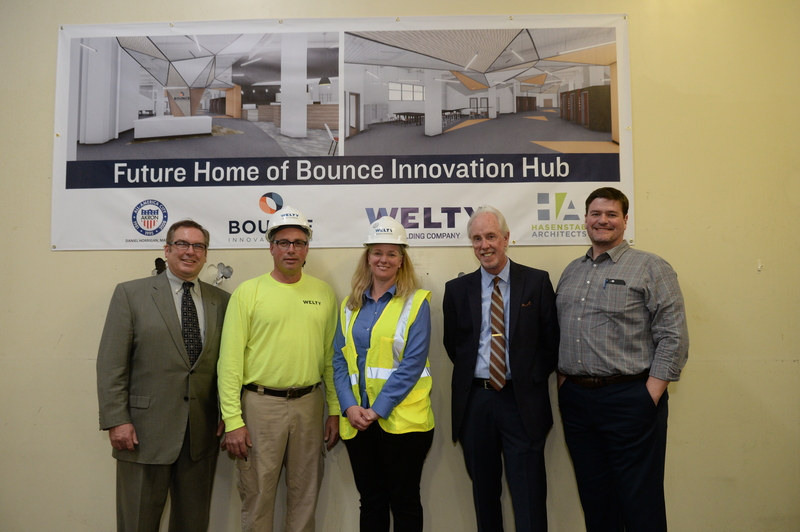 Employing about 300 people, Bounce is now at about 65 percent capacity. It encompasses 300,000 square-feet of office, lab and manufacturing space over nine floors. Of the current 52 tenants, 45 participate in the incubator program. The Bit Factory, which is focused on software, internet-connected hardware, mobile apps and gaming, serves 19 companies working off-site. The site’s renovation is expected to be complete by the end of the year.